The winning Giant Glory of Marcelo Gutierrez. 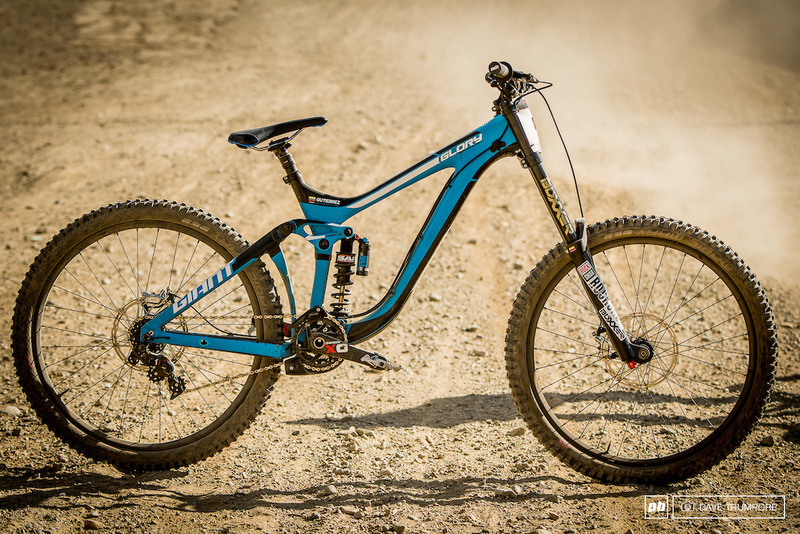 Since its inception, Specialized's Demo has been the most popular DH bike at Whistler, but is it the best? 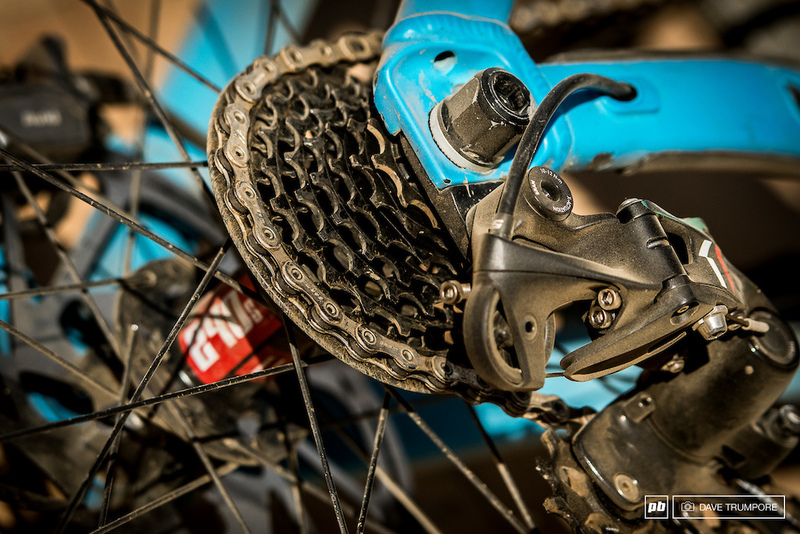 Marcelo Gutierrez has presented five reasons that Giant's Glory is the bike to beat on the holy mountain of gravity. 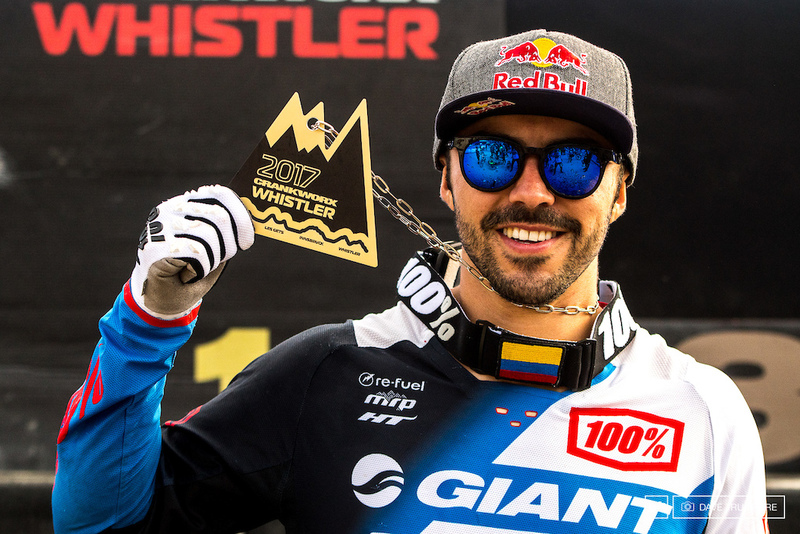 Gutierrez once again stomped all comers on the Garbanzo DH today to make it five in a row at Crankworx aboard his trusty Giant on a course that showcases the bike park's experience. Like many hopefuls, Gutierrez used a dropper post to shave some time from the pedal-heavy track. How good is the Glory? 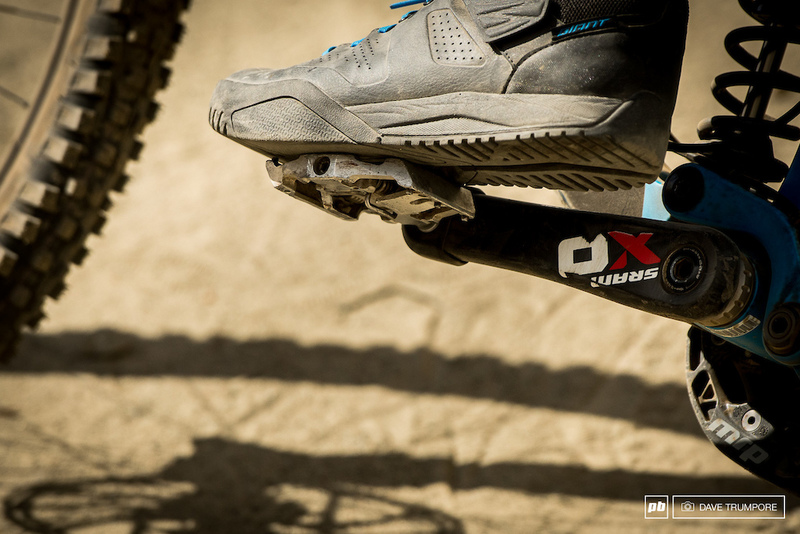 Next time you ride Whistler, demo one. ...And new Giant DH shoes in the works. 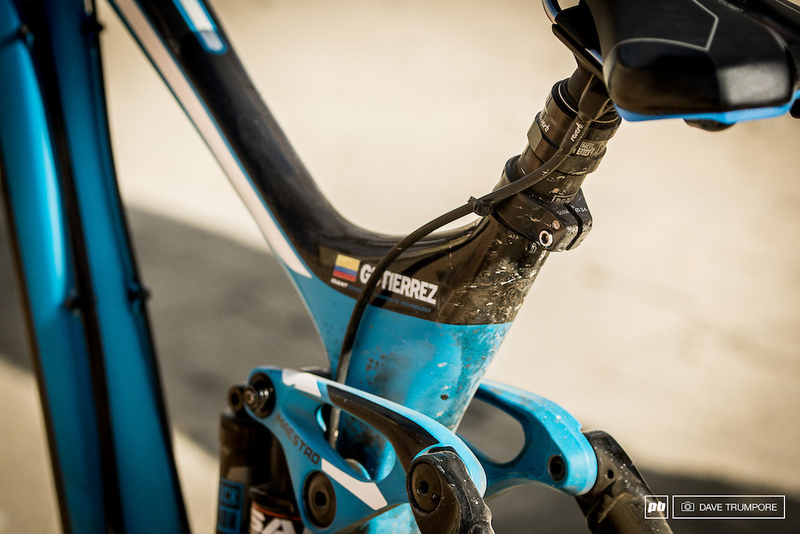 Marcelo opted for a RockShox Reverb dropper post to ace the pedaling sections. When you have as much power as Marcelo Gutierrez, you only need seven. 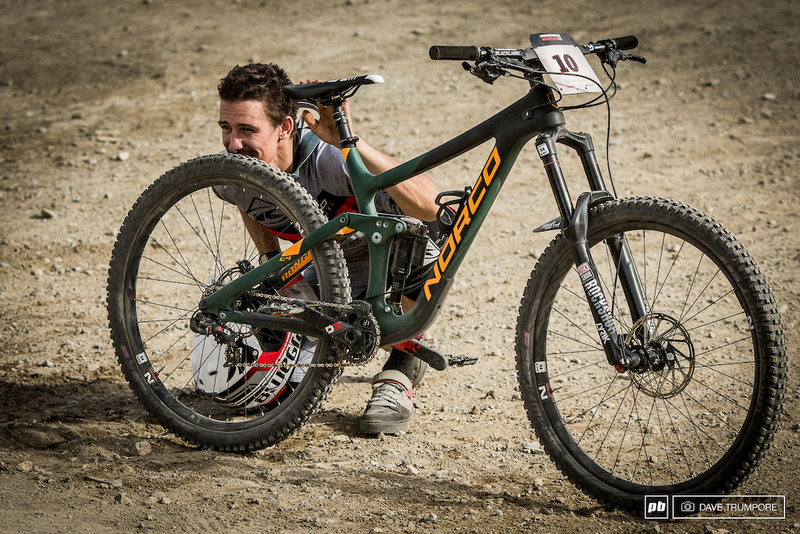 Sam Blenkinsop's secret Garbanzo weapon was his Norco Range enduro bike. The gamble earned him second place, six seconds back. 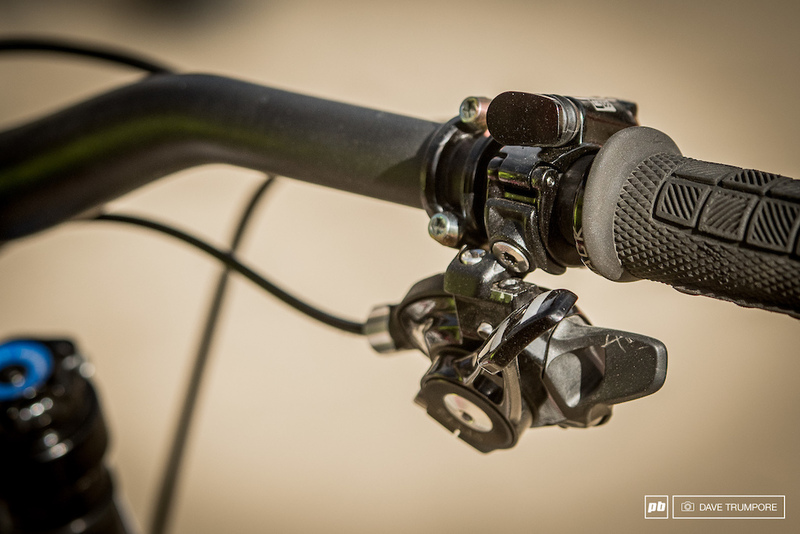 Sam Blenkinsop risked the advantage of his DH bike's superior suspension to reap the benefits of his Norco Range's quicker acceleration and pedaling. In the ultimate "could have/would have" story, Sam missed a ladder bridge on "In Deep" and crashed over the bars. In spite of that, he finished only six seconds behind Gutierrez. One can only wonder how the race would have played without the digger. Blenki's Norco uses Schwalbe's ProCore system. To counter the imbalance of ProCore's dual valve, his mechanic tapes weights to the rims. Blenki claims he can feel the difference on the high speed sections. Jack Moir chose to run a remote shock lockout on his Intense 29er DH prototype and was rewarded with a third place finish. We expect to see more big wheels and remotes popping up, as riders test for the World Champs in Cairns. The third spot of this year's Garbanzo went to a big-wheel DH bike rider who has been up in the world Cup standings ever since Intense launched the prototype at Fort William. 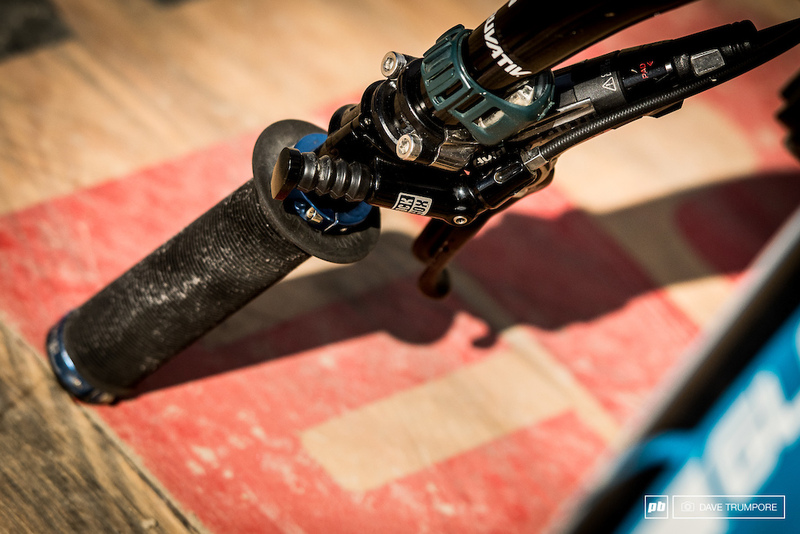 For Crankworx, RockShox added a remote lockout Super Deluxe Coil shock to Jack Moir's racebike - which apparently worked to his advantage. Will he use it on the pedally World Championships course at Cairns? ...And the dropper post remote mounted to the right side. Tracey Hannah's prototype Polygon was whisked away and hidden from view before anyone could get a proper shot of it. 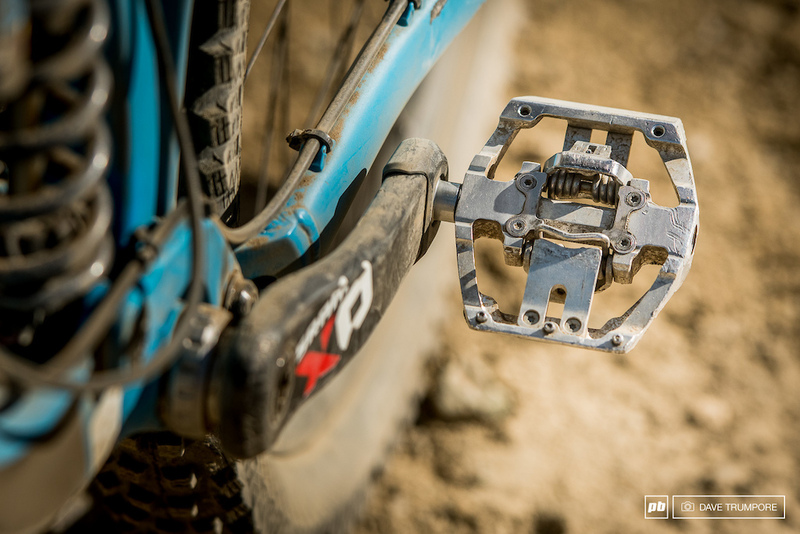 Polygon was the first brand to feature Naild's R3act rear suspension with the debut of the Square One, and its creator, Darrell Voss, was not shy about the possibility that a downhill version would follow soon after. 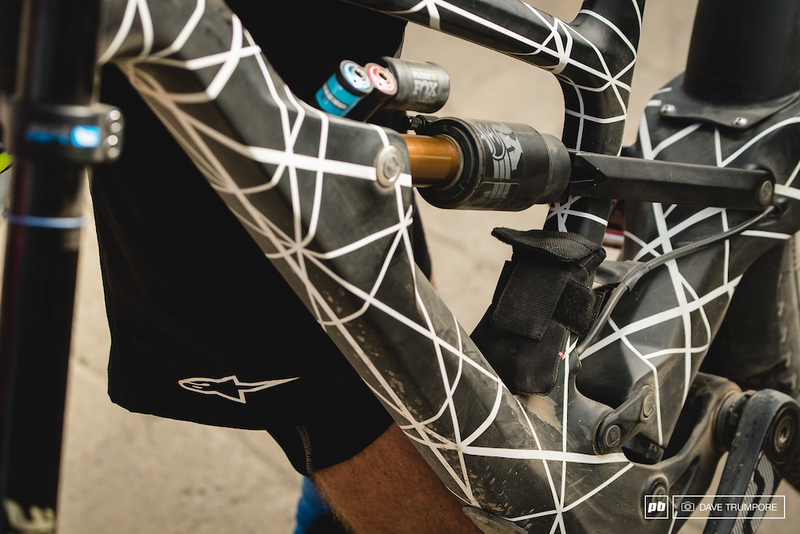 Voss said that the team brought three Polygon DH prototypes to Whistler a week early for testing, with the intention to seal them from sight in the box van before Crankworx began. The UR Polygon team would then return to their regular race bikes for the competitions. Women's Garbanzo champ, Tracey Hannah. Both Mick and Tracey Hannah decided to race the protos' after back to back runs turned up significantly faster on the bike park's blown-out DH trails. How much faster? Three seconds was the conservative number. Tracey said in a brief encounter that she was liking the new bike and had no plans to go back - and says that Mick is on the same page. With the World Cup series within reach and Cairns around the corner, the Hannahs are either taking a big risk, or they know something that we don't. The DH bike looks very much like Polygon's Square One, but its designer says that the swingarm and linkage kinematics are very different. that polygon is realy going to test the form over function philopshy, cause by all accounts the performance seems to be pretty legit, but boy it's definitly one of, if not the ungliest bike out their. Always thought it looked like it had a little too much junk in the trunk , but with a triple crown fork it'll really balance it out with that beefier front end... In this DH version it'll probably look much better! The Pontiac Aztek of mountain bikes. @IllestT: it's so ugly that actually gets beautiful! Just because the suspension platform may work well, doesn't mean they needed to design a bike that is so clunkly looking. I don't understand why the article on the Polygon states-all be it anecdoteally- the new DH frame is allegedly "three seconds faster" in testing, then alludes to the Hannnah's taking a "big risk, or know something we don't.."
They're racers and know the bike is faster. Doesn't sound like much of a mystery or risk to me. It sounds like a sensible decision to race the faster platform. @nickkk: I think it's mostly a comfort thing for a lot of these pros. They spend so much time on their bikes that switching to a new, albeit faster, bike is kind of an unknown thing for them. Kinda like buying a new corvette after driving a civic for a while. Sure it's faster, but you don't know all of the intricacies of it and you have to adjust to RWD coming from FWD. @wpplayer18: true, that's certainly a valid subtlety I hadn't thought of. However, it seemed an odd contradiction to make within a couple of sentences. Seemed clumsy and alluded to these pro's taking 'risks' they may not be fully considering- which of course as racers, they are the experts in mitigating any risk with the equipment used in a racing program. What a sweet roomy BB on that Polygon to jam a small motor in there. you know... for winning..
Maybe side number plates and a faux gas tank would help the look. Got to admit though, as ugly as it is, looks loads better than the "all mountain" version. An enduro bike. A prototype suspension and a 29er. That just proves its not the bike its the pilot that makes for podium finishes. A Giant and a Norco that run really well in Whistler. 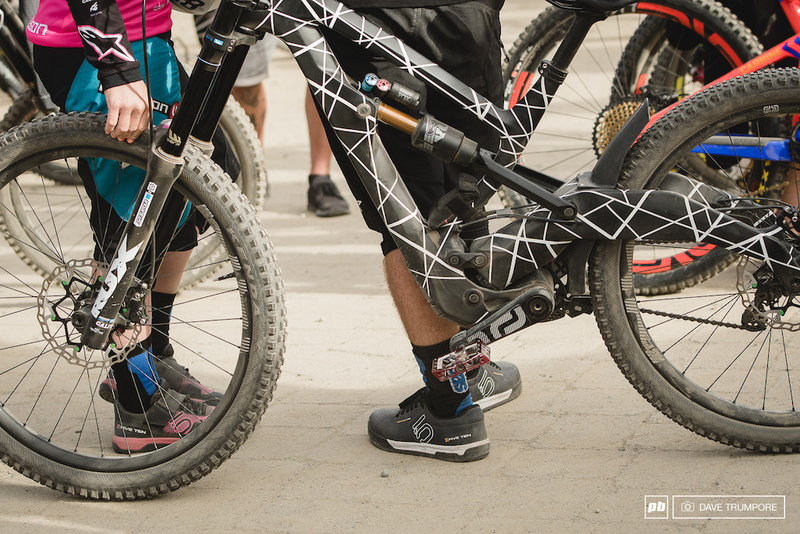 Makes infinite sense that Whistler went with GT's for their rental bikes. Not just the pilot. Of course skills play a lot in the results, but the bike does as well. Otherwise why would racing teams spend so much time testing setups, wheel sizes, suspension, pay considerable money to get the best mechanics, etc.. To win a that level you need both outstanding skills and top level bike. Gutierrez would have been beaten by any privateer if he had raced on a bmx..
Yeah but the enduro bike was 6 seconds back. That's a helluva gap for a short race. @seraph: he crashed on one of the bridges. By all accounts he would have won if not for going down. @seraph: short race? The winning times are in the 12 minute range. This is an extremely long DH run. The first section on Original Sin is probably faster on an enduro but In Deep is pretty rough, impressive Sam was that close! The entire bottom section would be faster on an enduro bike, but you would need to be in good shape to deal with the extra physical beating from the top. Tracy's legs look pretty hairy. @MisterJones: Oh, i thought those were Mick's. That Polygon looks super nice, hope to see more of this suspension design. 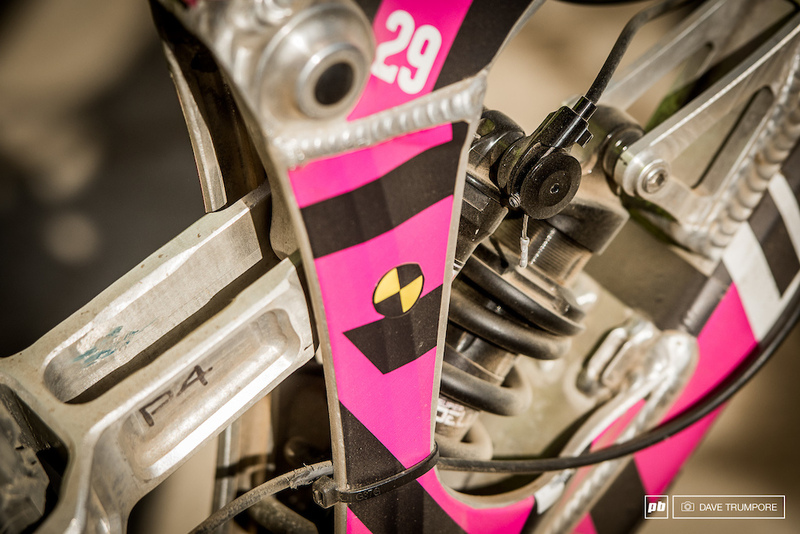 29" wheels, dropper posts and lock out shocks on DH bikes, whats next on the road of evolution? reducing the travel to 160mm? Dude it's not future it's past ! remember mitch rop 3 years ago with a enduro 29er in africa on a dh world cup ..
Garbo DH starts off really technical and then dumps into a long fireroad with an uphill pedal section (Golden Triangle after the Duffman exit). Dropper and lock out would get you seconds of time and let you rest a bit via sitting down while pedaling. Remember Graves 2nd in Worlds on a Yeti 6? @P3N54: lycra was banned in uci wc dhin 2008..
"The UCI, the governing body for competitive cycling, have changed the rules concerning mountain biking to ban the wearing of “tight-fitting clothing” as well as insisting that full-face helmets must be worn when racing and practising for downhill and four cross. 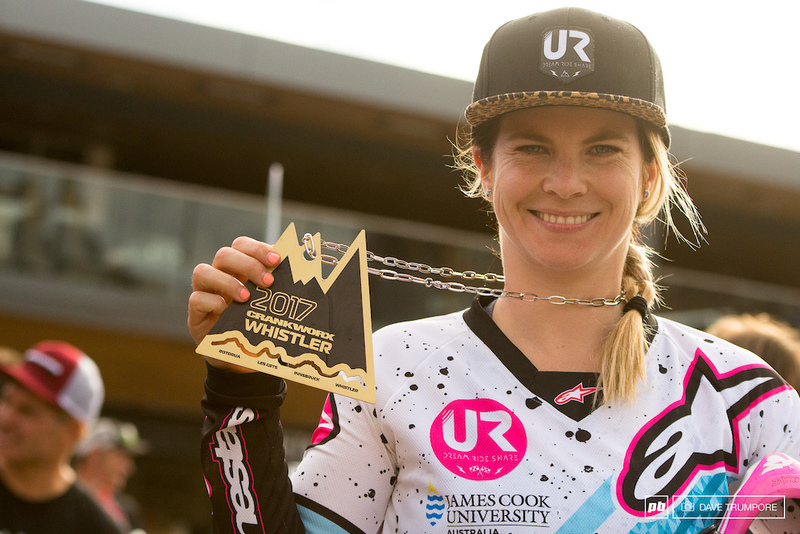 The wearing of skinsuits has been a point of contention over the last year, notably in the Australian round of the mountain bike world cup where Tracy Moseley, wearing a skinsuit, won the women’s race by four seconds from Rachel Atherton. Atherton wasn't happy that Moseley used a skinsuit, which being much more aerodynamic than loose clothing, would have given her an advantage. "Fair enough to Tracy if she wants to do that to win, but for the sport and the longevity of the sport, to wear cool race kit and to make an image for yourself is more important than the odd win here and there," said Atherton." Blenki absolutely flying by the sounds of it! Stoked for Gutierrez though, that's some serious consistency. 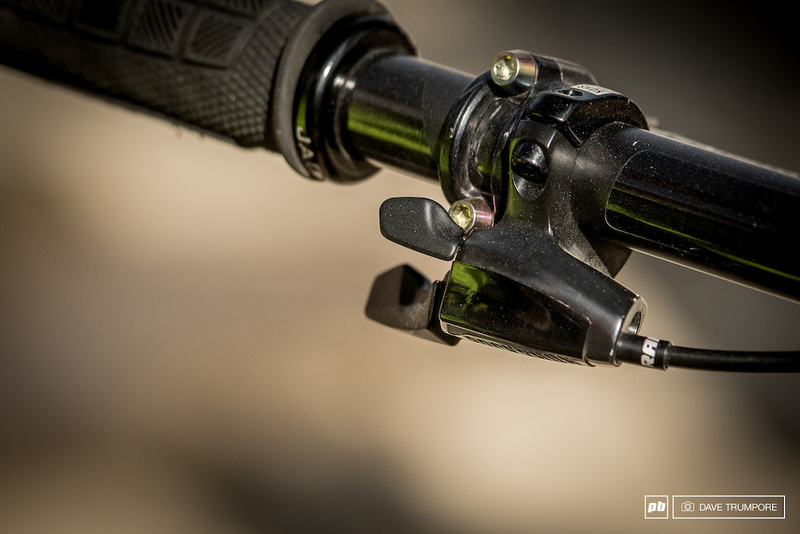 because the shock lock out is taking up the space under the left side of the bar where the shifter style dropper post would go. I actually love the look of that Polygon but it's jeez it's hard to look at with all those lines painted on the frame! Also I'm dying to see the next storm of bikes come through! And any new 29er that may roll out! "When you have as much power as Marcelo Gutierrez, you only need seven [gears]." This is nonsensical, being DH. 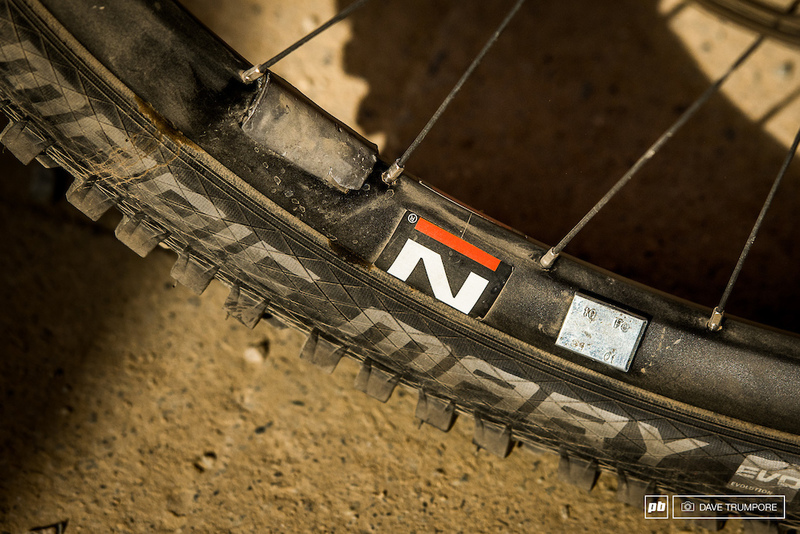 "Blenki's Norco uses Schwalbe's ProCore system. To counter the imbalance of ProCore's dual valve, his mechanic tapes weights to the rims. Blenki claims he can feel the difference on the high speed sections." I'm guessing all of us actually feel that, on pavement... I can't feel a thing on dirt, even flat dirt. no hate, but you probably don't ride as fast as Blenki on dirt. @bmck: I don't know, this guys obviously get paid for doing it, and do it probably daily, but on a straight, long line, on equal equipment, I think I'd hold my ground a bit. Of note, Tracey beat Clair by 10.98 seconds. Hate the bike all you want, but the results could care less for anyone's thoughts on the matter. Are we all forgetting the Blenkie is on an ENDURO bike and not a DH??? His wheels look awfully big. Umm, what was Claire riding? Emilie? C'mon guys, bring it. Claire: M16C, Emilie: Phoenix DH. Agree it would be cool to see bike checks for the entire podium! Polygon's Indonesia Square One, will be beast. Dropper, lockout... What's next, racing DH on an enduro bike??? Oh. Wow. Tracey Hannah's cranks look VERY short. I wonder what is the weight of the weights glued to Sam rims... 5g, 10g? Is Blenki dropping a #deuce behind his bike? Why doesn't Gwinner race this race? Anyone remember Mountain Cycles? Or am I the oldest person on this blog? Counterweight the weight of valve stems??!! OMG. I"ve been doin' it wrong. @Prax I may be incorrect, but I believe that procore valve stems weigh more than a typical valve stem because of the design needed for the dual chamber. So when the wheel is spinning fast enough, it could be noticeable. This is also the case for deep dish carbon wheels as the rim has to be reinforced for the valve to go through it and it leads to a single heavy spot in the rim. Spinning fast enough, it can cause a noticeable "hop." It can even be seen on a regular bike, throw your bike on a workstand and spin the back wheel up to speed in your highest gear and let it coast. There is probably a bit of shake in the back wheel from a slight weight imbalance. The weight serves the same purpose as a counterbalance in a centrifuge. Why don't we use something civilized, as Disqus, here? Polygon Square One=Marin Wolf Ridge? I believe they are sharing the design but have restrictions as to what they can do with it. I can't recall where I read it. Yep, same front end based on shared licensing agreement. I think there are some subtle differences in the swing arm. Different kinematics, back ends are Naild, front ends are proprietary to the host brand. @plyawn: I think you have that in reverse - the rear portion of the frame is licensed not the front. What are the brakes on that Polygon??? At least it doesn't look like a session. I have to say the glory looks quit dated now considering. There are lots of other manufacturers pushing the boundaries of bike design and this has stayed stagnant. If it ain't broke, don't fix it. Giant seems to have refined the Maestro over the years. And since it works so well, hence why every full-sus model is equipped with it? You could argue it's lazy, or avoiding new patents.. but there is no shying away from the 'looks like a session' suspension layouts that are all following a similar pattern? So I guess winning for the 5th time here doesn't count?